The State Department’s report found that the pipeline would not have a significant environmental impact. It was due to be finalized after a 90-day comment period ended in early May. The debate over TransCanada’s $5.3 billion proposed pipeline from northern Alberta to the Gulf Coast has long been a sore point between the Obama administration, environmentalists and lawmakers. 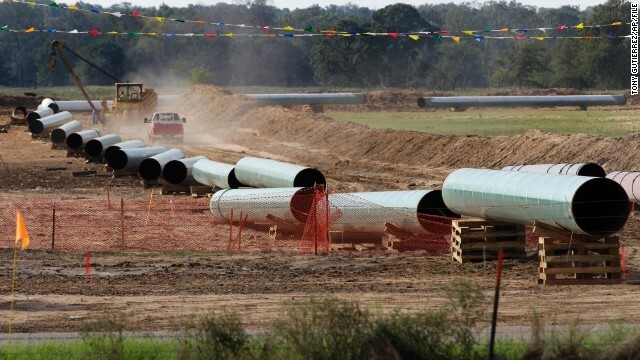 The pipeline would carry tar sands oil across six U.S. states. The “core reason” for the halt has to do with the case before Nebraska’s Supreme Court that could, whenever it is resolved, confirm or change the pipeline route. If the project route changes, then so might the agencies’ opinions on the pipeline, according to a senior State Department official. Environmentalists decry the project because they say the process of extracting and refining tar sands contributes more heavily to climate change than conventional oil production. The pipeline’s supporters, such as Senate Minority Leader Mitch McConnell, say research since 2008, when the project was first proposed, has shown the pipeline wouldn't significantly increase greenhouse gas emissions. “It is crystal clear that the Obama administration is simply not serious about American energy and American jobs,” McConnell said in a statement Friday. McConnell added that he is disappointed the president hasn’t done more on the matter by way of executive action. “I guess he wasn’t serious about having a pen and a phone, either,” McConnell said in the statement. Pipeline supporter Rep. Lee Terry, R-Nebraska, also blasted the delay. “Today, (President Obama) punted a tough decision in the name of political expediency,” Terry said in a statement sent to CNN. Obama, who in his State of the Union speech underscored climate change as a priority of his administration, has said the pipeline must be basically carbon-neutral, meaning it must have little to no effect on climate change. A Pew Research Center poll conducted in late February through mid-March found that 61% of Americans back the project, compared to 27% who oppose it. Republicans such as McConnell argue the pipeline is critical to help shore up the economy. Labor unions are hoping the pipeline project can boost jobs. And four politically-embattled Democrats - Mary Landrieu in Louisiana, Mark Begich in Alaska, Mark Pryor in Arkansas and Kay Hagan of North Carolina – also want the pipeline. Sen. Barbara Boxer, who chairs of the Senate Environment and Public Works Committee, isn't entirely happy (she wants a separate study on health impact), but overall she applauded the delay. “Given the unprecedented number of comments from the public on the Keystone XL pipeline proposal, and the legal uncertainties due to lawsuits in Nebraska, the State Department was entirely correct to delay a decision on the pipeline,” she wrote. Weak, indecisive, feckless, debasing, worthless, dictatorial, bully, braggart, conceited, ineffective – on and on. Everyday these and other adjectives describe the man who, singlehandedly, is destroying the US and its place in the world economy and politics. The purpose of that filthy pipeline is to make tar sands oil available for export. Nothing more. It absolutely amazes me how gullible American conservatives really are. NO BENEFITS. Ziltch. Stop this foolish pipeline – and stop McConnell as well later this year. As a person who has worked in the oil/chemical industry for over 25 years, I am glad that the US may divert the Keystone pipeline. We don't need a pipeline from Canada to the Gulf Coast and have the oil bound for China. The US is refining and producing more oil today than in the past 20 years. There is only one way to lower the cost of gasoline; reduce demand. As long as the economy in China continue to grow at 8 to 9 percent per year; oil companies have a responsibility to it's share holders to earn a profit. If these companies can well gasoline to Americans for $3/gallon and China is willing to pay $5/gallon; capitalism says these companies should sell every drop to China. As Americans; we're spoiled and think we have a right to $2/gallon gasoline. Visit Canada or Europe and see what gasoline sells for in these companies. Maybe then we Americans will stop complaining. "Sniffit – Your post is 100% incorrect. When pipelines are built, land is not taken. Easements are granted, the pipe is buried, and the landowner resumes normal use of his land. The landowner is responsible for calling One-Call, if he chooses to dig near the pipeline – but that's it. No inconvenience. I lived on a farm in Iowa that had a pipeline running right through it. Every week the pipeline company flew a plane low along the pipeline, inspecting for any leaks. And the fenceposts over the pipeline were blue/yellow – that's the only difference. Our farmland on top of the pipeline was just as productive as the land on either side of it, with zero inconvenience to us." WOW. Listen, Champ, I'm an eminent domain attorney for landowners whose land gets taken. This pipeline is a goldmine waiting to happen for plaintiff's eminent domain attorneys in the states its going to plow through. Nebraska just had its attempts to give the private corporation involved the power of eminent domain overturned by the Court because it failed to follow proper procedures. Sure, some property owners might make a deal and "grant" the necessary easements or sell off portions of their property or even all of their property voluntarily because they think they're getting the right price. Any of them that don't want to will face an eminent domain "taking." And that taking WILL happen to hundreds of people/families...be it simply easements or actual takings of the property itself. As to your claim that having construction equipment all over your property and a massive oil pipeline buried in it is "no inconvenience," jury verdicts beg to differ. Just because you felt there was no inconvenience in your own experience or didn't take your chance to get more money or whatever, doesn't mean there aren't people out there who won't feel it's a complete screw job. And we wonder why the entire world laughs at our gutless wonder of a leader. This liar couldn't lead a pack of hungry wolfs to a piece of filet!!! Will this liar ever grow a set of b lls? If you were an honest critical thinker you would know that the Koch's have no position and have not lobbied on this at all. Also, they will lose money if this is built. Stop reading Mother Jones, watching MSNBC and the Huffington Post. If you were honest, you would at least fact check before you post your silliness. I know, you only believe Hannity, but you have all day to check the facts. The Kochs have 1.1 million acres next to the tar sands making them the largest landowners in Canada. Maybe you should just restrict your comments to what the girls on Fox are wearing. The Koch's founded and/or funded most of the "grass roots" and Tea Party / contemporary conservative orgs out there. The only conspiracy sound bites they let fly are beneficial to them in some way so why am I not surprised about this land thing. The reality is that they only have financial control interest and no politics. They are using the conservative sheep because they are expedient for now. It is amazing that the conservative commentators make no effort whatsoever to check facts. The nutjob libs who hate the pipeline are also the ones who will vote for the Democrat candidates without question. Obama doesn't care about the environment, he cares about votes and his own party. The pipeline has cleared all the hurdles. He's just keeping the approval of it in his back pocket for when he needs it most. Doesn't anyone understand politics? Just say NO and be done with this farce. And at some later time the next knee-jerk conservative will claim he is a total dictator controlling everything and dominating our country. You know those are opposite, right? The right wing might sound moral but it is a very flexible morality when it comes to facts and making stuff up. @Anonymous,"great decision"????? How about a decision for a change. This is all too much like then Senator Obama's "Present' votes. If he is going to kill it, then kill it. It is called leadership. You know, making a decision and then acting on it. What is shortsighted about putting a bullet in the project and getting on with other important matters? "In layman's terms, oil production is up DESPITE the meddling and wishes of Obama, certainly not because of it." No, no "despite." He's done nothing to hamper the permits Bush granted. Granting less of them because the permits Bush granted are doing their job and increasing production is perfectly reasonable. Bush's willy-nilly permit granting made it less necessary for Obama to grant more of them. When production is at an all time high, regardless of why, you don't necessarily have to continue granting new permits and leases, etc., at the same rate as before. So no, he's done nothing to actually halt or hamper production or slow it, like the GOP/Teatrolls like to try to claim, and "despite" your ridiculous attempt to imply that he has tried to halt or slow it by using the word "despite." Once again GOP Gov Heiniman is at the center of xl pipeline delay and trying to pin it on Obama. This will all come out closer to the election and after Nebraska and the GOP are clearly caught playing both sides of the pipeline story. The state department would have approved this if it was not for GOP Nebraska, and then the President would have signed it. Now, it has to wait until once again gov. Heiniman drags his feet. Google the Cavuto interview with him, that shows you all about the games the GOP are playing with this pipeline. Obama will approve the pipeline after the mid-terms. The delays on the ACA and Keystone are about the mid-terms. The sad part is everyone knows this but the Dems think the american people stupid. Besides not being of any real benefit, the proposed pipeline is due to run right up through Lakota lands, violating current treaties. At what point do we stop victimizing these people and stealing from them? It's a wonder they take our word for anything at all. Just amazing. They know we don't do nothing but lie and steal. It has nothing to do with the environment but everything to do with Warren Buffet's opposition due to his vast financial interest in railroad transportation. I saw a report that this is Pipe would run through some reservations does anyone know if this is true. If so it would be a shame for the U.S. to back down on its word yet again. During Bush’s second term, on average, 3,360 new leases were issued per year, 6,264 permits approved each year, and 4,884 new wells were started annually. During Obama’s first term, on average, 2,546 new leases were issued per year, 4,273 permits approved each year, and 3,231 new wells were started annually. So, Obama's first term was basically on par with Bush's first term...maybe even a little more oil friendly, but basically about the same. The only reason you can Google up articles and blogs from conservative idiots ranting about permits and leases being "down 36% under Obama" is because Bush went hog wild in his second term, increased the rate at which he was granting them by huge amounts. Yeah, Obama went back to the same rate of granting them that Bush was in his first term before he ramped up the permitting. So there's a pipeline to be built to deliver Canadian tar sand oil down to the Gulf to be solely exported to India and China. This is huge! It is a great plan to put 300 people to work (temporarily), line the golden pockets of the refinery owners/exporters and make a couple Canadians really rich. Who wouldn't love this project!!! I could care less about the pipeline.. what I care about is the BS from the GOP about thousands of jobs, energy independence, cheaper gasoline for America, blah, blah, blah. Approx 9,000 jobs DURING CONSTRUCTION, under a 100 permanent jobs (spread across 6 states). The US is already a net energy exporter, and the tar sands oil will be refined and shipped to China, while we get left to dispose of the remaining sludge. Cheaper gasoline will not be a benefit of the XL pipeline. In the midwest, it may even INCREASE in price as the oil there will be shipped off the to highest bidder via the XL. Profits, profits, profits for big oil is the outcome of this pipeline.. I just wish the GOP would fess up to the reality and quit with the spin. And they wonder why many of us don't take them seriously..
Dems hate food and oil but they sure can cook up some some lie !